"Compiling your own data source: How it feels to copy and paste for 48 hours"
"Functionality vs. Design: How I didn't balance my time right"
"Infographic vs. Interactivity: I want both"
"The other entries are so intimidatingly good where do I even start?" I could tell you about the weeks I spent brainstorming without being inspired. I could tell you about spending Mother's Day weekend compiling data in Excel and leaving myself 10 hours to actually visualize it. I could even tell you about the extreme disappointment when I submitted my viz 4 minutes before the deadline-- only to find that the colors (that were beautiful on my computer screen) were totally gross when I looked on my phone (and the other screens I checked). That was a bummer. Instead, what I want to tell you about is the power of simplifying. Don't worry, it's not as boring as it sounds. The following could also be titled: "Design mistakes I made in an attempt to find the wow factor." As usual, I am going to be honest with you. One of the main reasons I had a hard time getting off the line in this competition is because I was intimidated. I design and build data visualizations to be tools, to translate complicated numbers into something people can understand, and to tell a story. It would seem that a competition that is judged on (1) analysis, (2) storytelling, and (3) design would be right up my alley. False. I feel that there is a "wow" factor required for Iron Viz that is hard for me. I want my designs to be clean, effective, and aesthetically pleasing. Often times, this means my design is simple. I seriously love a good bar chart. I look at the competition entries being published and I think: "holy crap that's cool", which is quickly followed by "I can't compete with that". Then on Friday, while scrolling the amazing #IronViz twitter feed, I came across a post by Lindsay Betzendahl that reminded me of why I wanted to do this in the first place. Her post was titled "I #IronViz Not to Win But to Be". That hit home. So, with a much needed boost and little time to spare, I said goodbye to my weekend and I went full speed ahead. I made the commitment to myself that I would submit an entry. No matter what. I designed, I compiled, and I vizzed. I am happy to say that I made the deadline (which was not looking promising at about 9pm with half of my dashboard still blank). My perfectionist self didn't want to submit what I had, but I am happy I did (my Twitter post just after midnight will back this up). I'm done! But not quite… I woke up this morning and could immediately see where I went wrong: the "wow". My viz was over-complicated in an attempt to find this elusive "wow" factor. I believe at 11pm last night this translated in my head as "put as many cool and interesting things on the dashboard as you possibly can". Unfortunately, this is not my style (or best practice for that matter), and therefore the visualization I submitted doesn't feel right. Both my layout and my story felt cluttered. With a few hours of sleep and fresh eyes, I have created a second iteration of my dashboard this morning. A little makeover of my own work if you will. I didn't do it for the competition (that deadline has passed), but rather for the spirit behind the competition: to practice and hone my skills and to participate and share in the Tableau community. This truly has been a valuable learning experience for me. So what did I do? I simplified. When you spend time compiling and building something, the right thing to do (delete it!) often feels wrong. That being said, when I took a step back it was clear to see elements of my dashboard that were not contributing to the story I was trying to tell. I asked myself: Is that chart really necessary or would a simple number be clearer? What do those countries even represent? Where is my eye being drawn and is that where I want people to focus? Is it just me or is that graph seriously hard to read? In the end, a couple small design changes made a big impact in my eyes. I have a visualization that is cleaner and clearer and I can honestly say that I am excited for the next feeder competition to put my newfound insights into practice. Lesson 1: Two minutes is not a lot of time. I arbitrarily chose this number. I knew that I wanted the videos to be short, but I chose two minutes primarily because the number two started with a T (which for some reason has emerged as a theme when I am in charge of naming things). Getting an intro, a topic summary, a statement about why it matters, a step-by-step how-to, and a conclusion all crammed into two minutes is a challenge in itself. Increasing my time limit would actually decrease the amount of time it takes me to complete each video. Lesson 2: Outlines are gold. The first couple of weeks I had a fly-by-the-seat-of-my-pants approach to filming. I decided what my topic would be, which dashboard I would use as an example (and in some cases this meant creating a new one), and generally what I wanted to say. This resulted fairly consistently in multiple hours of filming myself stumbling over my words while trying to figure out how exactly to say what I wanted to say. Now I use a much more strategic approach where I outline exactly what I want to touch on in the two minutes. Not only does it take less time to reach a final product, I think it is a clearer and the quality is better. The downside: the outtakes aren't nearly as entertaining. Lesson 3: Rush it a little. Like many people, I am my own harshest critic. I could film and re-film forever and still feel there was room for improvement. I did an experiment on week three where I decided to film on Monday so that I wouldn't feel as rushed. Bad idea. The more time I have, the more time I will spend on unnecessary iterations. I quickly returned to scripting, filming, and publishing on Tuesday mornings to keep a limit on the amount of time I spend. Lesson 4: Start with a dance. Different people have different ways of pumping themselves up. Most people know that I am a Zumba Fitness instructor-- so for me it's all about putting on Despacito and my dancing shoes. You may think I'm joking here, but I have found that getting up and doing a few spins right before filming results in a more energetic, genuine, and engaging video. Going to film something? Get up out of your chair and do whatever gets you going first. Lesson 5: Love it and leave it on social. Publishing a video of yourself can be a vulnerable experience. The first couple of weeks, I found myself refreshing my social media sites nearly non-stop to see if there were new comments or likes..or dislikes. I now have a rule that after I publish, I have to accept that I am opening myself up to whatever response or feedback may follow and I'm not allowed to obsess over it-- I can just learn from it. I hope to continue to learn and improve each week so stay tuned for future updates! Didn't catch the first 5 weeks of Tableau Tutorial Tuesday? You can see them here or watch them below. ​Why Tableau Tutorial Tuesday? My inspiration to challenge myself to do Tableau Tutorial Tuesdays was and continues to be the Tableau community. I have found it to be a community that is built around a common passion that thrives on knowledge sharing and support at all experience levels. Every user group, every conference, every presentation-- they all have those 'ah ha' moments where someone shows something (that may or may not be the focus of their presentation) that goes into my toolbox for future use. There are countless amazing blogs, twitter feeds, and other resources out there to learn Tableau, but often times it is that 10-second 'ah ha' moment on something that may seem small that transforms how I use the software. Tableau Tutorial Tuesday is my way of sharing some of the 'ah ha' moments I have learned back to the community. Let me start by saying that I am a fan of using red and green or "traffic light" colors in my data visualizations. Yes, I know this is not always a popular opinion. In my experience, I have found this to be a highly debated topic and often said to be bad practice. I understand the reasoning behind the case for avoiding traffic light colors. For the percentage of the population with color vision deficiency, red and green can be indistinguishable and the visualization can become meaningless. I was recently at a workshop with Steve Wexler in Seattle on the Big Book of Dashboards co-authored by Steve, Jeffrey Shaffer, and Andy Cotgreave, and one of my greatest takeaways was a reminder that the objective of a dashboard is to facilitate the largest amount of understanding to the most people in the least amount of time possible. This is precisely why I often use red and green in my business dashboards when I am working with stakeholders who are accustomed to a red/green palette to indicate positive and negative results. The majority of my stakeholders (most amount of people) are accustomed to a red/green palette to indicate positive and negative results (largest amount of understanding) and therefore there is no time required to decode the meaning of the color (least amount of time). Of course, whenever I have had a stakeholder who was unable to distinguish between red and green, I would use a color palette that suited their needs. That being said, it has not been my standard practice to always design my dashboards to be colorblind friendly just in case. Now, I believe I have found a compromise. In celebration of Black History Month, there has been a call to the viz community to raise awareness on various subjects connected to black history. This week the challenge is 'education, color, and words'. My visualization aims to use simple and bold color along with quotes from the Department of Education to raise awareness around Historically Black Colleges and Universities (HBCUs): what they are, where they are, and how to learn more! In my last post, I introduced the Tableau #HackOpenData hackathon and the initial viz I created leveraging open education data (Go #VizzingEd team!). The questions I have received from my new team and the visualizations of the other team leads has inspired me to keep vizzing. The main question I have heard is "I'm not sure what to viz about" or "I don't know what question I want to answer." My first response has been to ask if there are any current social issues around education they are passionate or concerned about. After asking that question to others a few times, I turned around and asked it of myself. One of the issues that I feel strongly about is the idea that everyone must go to college in order to be successful. Don't get me wrong, I think higher education is extremely important, but not everyone has the means or the desire to continue their education after high school. This inspired a new visualization to look at careers with a typical high school educational level and high employment projections. An interesting point about finding the open data for this viz is that that education is not the primary focus of the data, yet it is still the focus of the visualization. Instead of looking for an open data set centered around education, I looked for a data set that addresses the educational issue I am concerned with. In the end, I found an open data set on occupations with secondary information on education that is leveraged in the visualization. Last month, I was truly honored to be selected as one of the first 12 Tableau Public Ambassadors. This month, I am excited to perform my first duty! I am leading the #VizzingEd Hacking Education Data team for a virtual Tableau Public Hackathon Feb 17-23. You can see all the details here and register (join my team!!) here. To get us started / provide a sample data set / have an excuse to play in Tableau, I put together the "Find Your College Tool" below. The most challenging part of this exercise was narrowing my focus and defining a clear purpose and story for my visualization. Once I found my purpose, the rest was just putting the puzzle pieces together. So what is this purpose I speak of? 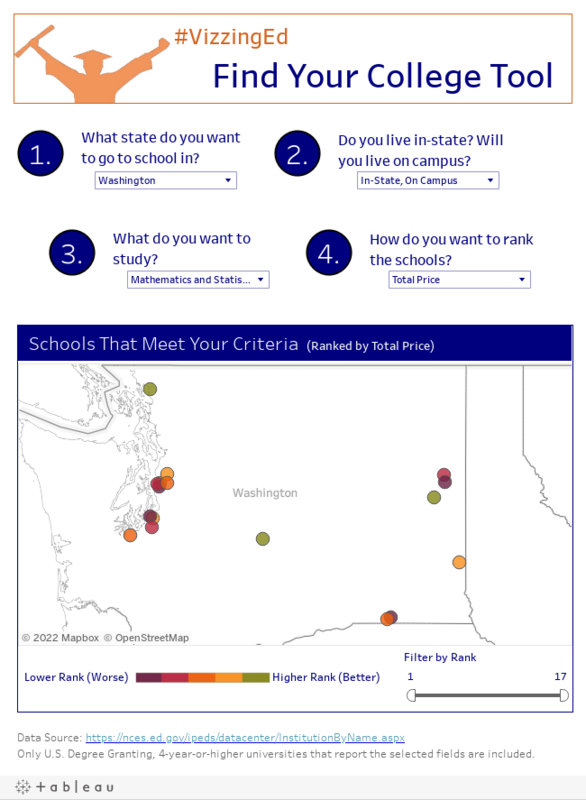 A tool that clearly shows an aspiring college student what schools offer programs in their desired field of study, in their desired location, and allow them to navigate those schools based on some key characteristics (like how much $$ it will cost them to attend, how many students receive student loans, and how likely they are to get in). This tool only leverages a tiny slice of the open data on education (so small you wouldn't even be able to see it on a pie chart). The possibilities for hacking public education data are endless and the amount of data available can become overwhelming. My advice? Take a look at the types of data available and brainstorm ideas for the story you want to tell. 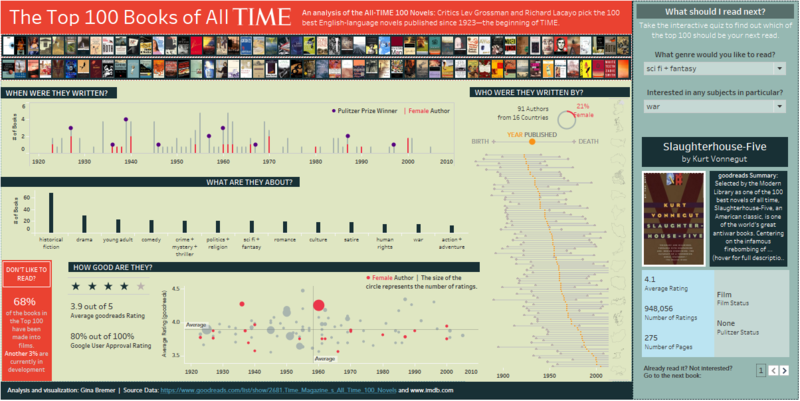 Once you settle on an idea, get dirty in the data and start building your visualization! Where do I find this open education data? You can download this workbook and leverage the IPEDS data that I have pulled, you can export a different set of variables from the IPEDS Data Center, or you can always leverage a little thing called google to find other sources of edu data! ​The following was released as a four-part series on Payscale.com: (1) gender and income, (2) educational level, (3) gender and age, and (4) U.S. metro. Politics is a touchy subject. That's why, for most people, there's an unspoken understanding that there is a time and a place for political conversation. That place does not include long rants on Facebook, heated discussions with strangers in the grocery line, or while sitting down to a nice family meal. The 2016 election has taken that unspoken understanding and thrown it out the window. These days you are hard-pressed to find a time and place where politics aren’t dominating the conversation. I have observed friends, coworkers, celebrities, organizations, and citizens of the world take a stand in this election for whichever candidate they support on whichever social media platform they see fit. There is no debate that this election is a polarizing one, but just how polarizing? When PayScale started asking survey respondents who they plan to vote for in the upcoming election after the conventions in July, I could hardly wait to get my hands on the data to investigate that very question. 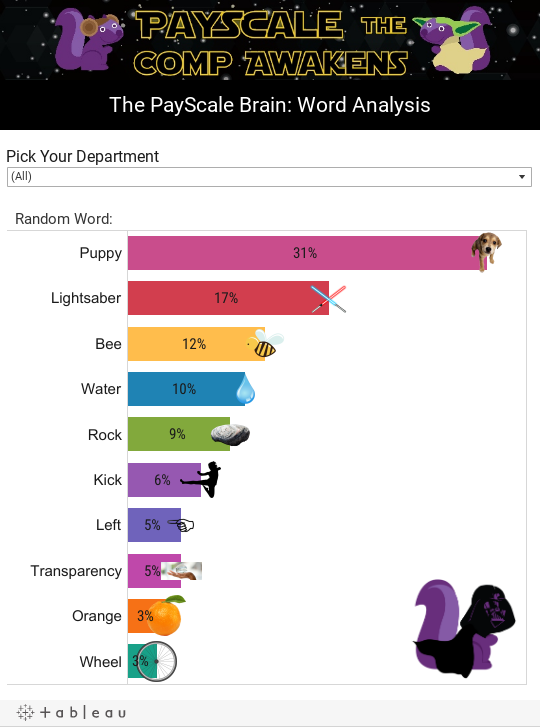 PayScale has already analyzed and produced fascinating reports with the survey results (see PayScale’s election coverage). The question I wanted to explore with the data is: How divided is support for Clinton and Trump by demographic? The answer I found is, not surprisingly, very divided. PayScale collected more than 100,000 responses to the question “Who do you plan to vote for in the November presidential election?” between August 4, 2016 and October 10, 2016. Twenty-six percent of respondents specified that they plan to vote either Clinton/Kaine or Trump/Pence (53 percent - prefer not to say; 15 percent - Clinton/Kaine; 11 percent - undecided; 11 percent - Trump/Pence; 5 percent - third-party candidate, 4 percent - do not intent to vote). The following analysis looks at the divide in support for Clinton and Trump from the pool of voters that specified they plan to vote for one of the two, by demographic. Key Point: More than 50 percent of women at every pay grade are for Hillary. The higher the pay grade, the bigger the gap in female candidate support. Looking at income level, the smallest divide in support from females is seen by those who earn under $25,000 a year, with 59 percent of respondents reporting they plan to vote for Clinton (out of the set planning to support one of the two main candidates). The division in support grows as income levels grow, with the largest division seen by females who earn over $250,000 a year (90 percent Clinton, 10 percent Trump). While women are quite divergent, men are more evenly split. Males who earn over $250,000 a year are split 56 percent for Clinton and 44 percent for Trump. Key Point: More educated, more likely to vote Clinton. If you have at least a bachelor’s degree, you are in a pool of voters that favors Clinton. Sixty-seven percent of respondents who earned a bachelor’s degree (and no higher degree) and specified they plan to vote for either Clinton or Trump, are planning to vote for Clinton. Of those who went on to earn a PhD, 84 percent are in favor of Clinton. Key Point: The trend in candidate support by age and gender is not the same for males and females. Taking age out of the equation, we see a large divide in support for our Democratic candidate and Republican candidate from females. Of voters planning to vote for one of the two main party candidates, 67 percent of females plan to vote for Clinton. The division in support from males is much smaller with 52 percent planning to vote Trump. Adding age back into the equation, the division grows even larger for females, ages 22-37, with the greatest division held by those 26-27 years old — a whopping 82 percent of females 26-27 years old plan to vote for Clinton. The biggest divide for males? It’s nearly a tie between those 18-19 years old (68 percent Trump) and those 54-55 years old (67 percent Trump). Key Point: The division in candidate support by generation grows smaller with age for females and larger with age for males. Seventy-nine percent of female millennials (18 to <33 years old) who specified they plan to vote for either Clinton or Trump plan to vote for Clinton, leaving only 21 percent who plan to vote Trump. This is the biggest split for any gender/generation combination. The split for female baby boomers (50 to <69 years old) shrinks to 55 percent for Clinton vs. 45 percent for Trump. Interestingly, male millennials have a similar split as female boomers (54-46 percent in favor of Clinton). Unlike females, the division between male support grows with age — 62 percent of male baby boomers plan to vote Trump. Key Point: I wouldn’t recommend wearing a Trump hat in San Francisco. Can you guess the metros with the biggest division in candidate support? San Francisco comes in at #1 biggest division with 92 percent of respondents who specified they plan to vote either Clinton or Trump voting Clinton. Seattle (home of PayScale HQ) comes in at #2 with 86 percent responding they plan to vote Clinton. Last week, I found myself in a bit of a predicament. With a left knee ACL reconstruction surgery scheduled for Friday and a car with a manual transmission that I will be unable to drive for months, I needed a new car and I needed it fast. I started shopping new and used cars and found a used 2009 Subaru Outback in mint condition that I was super jazzed about. From working at PayScale for the past 2 and a half years, I understand the importance of knowing your worth in the current market is key when negotiating salary. I figured, why not use the same principal for cars? Before I went in to try and negotiate the price of the car, I needed to understand the value of the car in the current market. 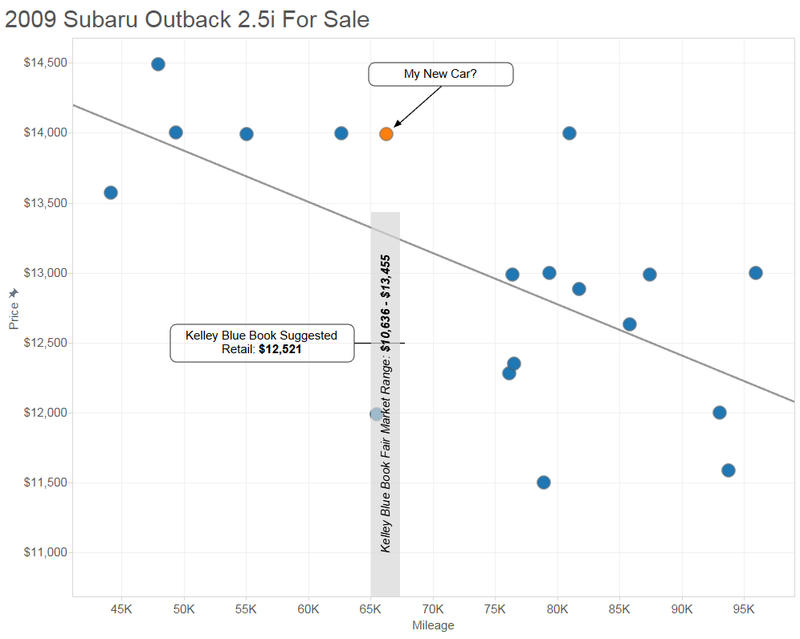 I collected data on cars of the same year, make, and model off of Autotrader and Kelley Blue Book. After importing this data into Tableau, I quickly realized I had some wiggle room to negotiate, and I had the data to back it up. I wish I could say that was the end of the story. I went into the dealership prepared with my negotiation material ready and my game face on. Unfortunately, we didn’t get that far. After test driving the car and hearing some funky noises, I called my brother to come check it out. He found multiple problems with the car and advised me not to purchase. I said goodbye to the car and was back to square one. I was feeling less comfortable than ever with the idea of a used car. I was minutes away from buying a potential time and money leech. 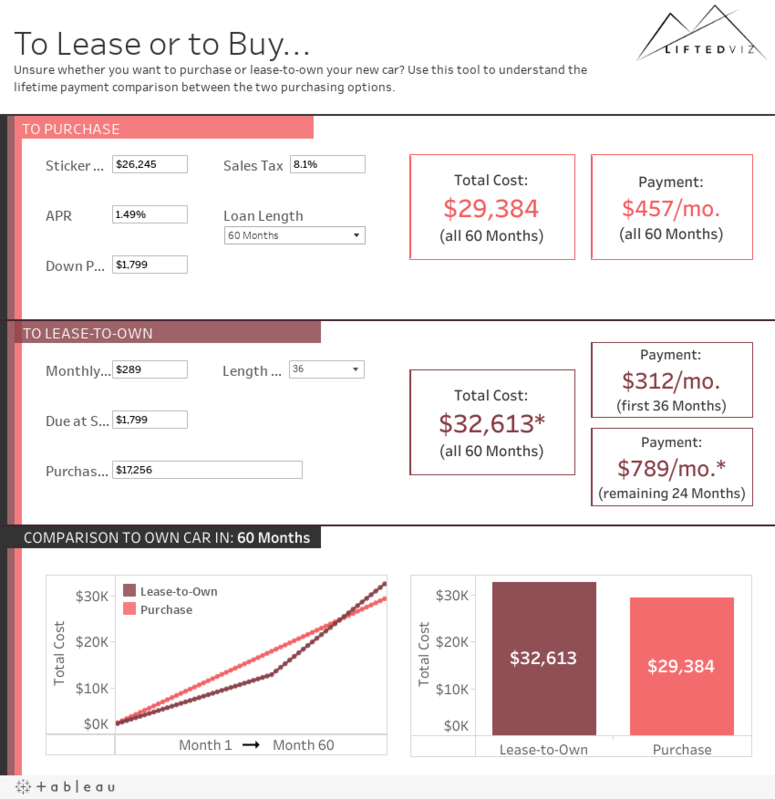 I was back to the idea that buying or leasing a new car was going to be the option for me. My brother, sister-in-law and I went to the Subaru dealership to learn about the 2016 financing and lease deals. The problem is, it’s hard to understand which is the better option. Many, including myself, have opinions on this matter. Personally, I am a big fan of leases. They are hassle-free, I don’t drive that many miles so staying within the limit is never a problem, I don’t have to commit to a car for more than 2-3 years, I never have any unexpected costs, and I can typically get a lower monthly payment. That being said, I may be ready to buy a car in anticipation of keeping it a little longer. Therefore, the question I needed answered was: is it a better deal in the long run to lease-to-own or buy? What is the gender pay gap? This is a question I have frequently asked myself while analyzing data at PayScale. I look at data on a daily basis that shows women earn less than men. My job provides me the unique opportunity to analyze compensation data that is crowd-sourced from millions of people, but what does it really mean to analyze the data? It is easy to aggregate salary profiles and calculate the national median pay for men ($60,200) and the national median pay for women ($44,800) and then do some basic math to show the percentage change male vs. female is -25.6 percent. But when I simply analyze the data and say that women earn 74 cents for every dollar a man earns when comparing all men to all women, am I done? At PayScale, we look at these numbers and immediately start asking questions. First, the most obvious question: why do we see this difference? Specifically, can we determine what factors are contributing most to this difference? Can we control for these factors? Do we still see this difference? Does the gender pay gap change with marital and family status, job, industry, etc.? To answer these questions, PayScale’s fabulous consumer marketing team and I produced an entire data package that takes a closer look at the gender pay gap. I was able to dive into the raw data and compare the salaries of all men and women taking into account a variety of factors. What’s even better? We have the ability at PayScale to look at a more “apples-to-apples” comparison by controlling for measured compensable factors including job, years of experience, industry, education, and more by leveraging our complex statistical compensation model. Therefore, we are able to calculate a controlled female median pay ($58,600). When comparing similar men and women in similar jobs, we find the median pay for women is 2.7 percent less than the male median pay. Are you thinking “well that’s not that bad”? Think again. Not only are women in the same roles with the same measured compensable factors still paid less on average, this also shows high paying jobs and industries are still dominated by men. How’s that? If men and women had an equal share in lucrative positions, our uncontrolled pay gap would not be a whopping -25.6 percent. This is a difficult story to tell, even with access to the largest database of individual compensation profiles in the world. After analyzing, slicing, and dicing over 1.4 million salary profiles, we needed a way to present this data. As a Tableau enthusiast, my first inclination was to make a data visualization to show the pay inequity found. The problem is that one visualization simply can’t tell the whole story. That’s where the Tableau story points came into play. 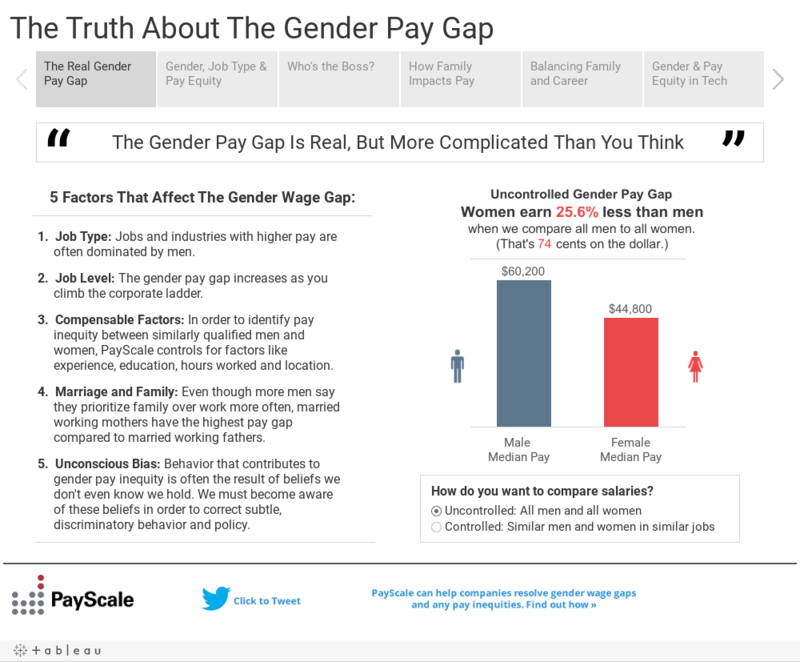 The result is a visualization with six story points that reveals the truth about the gender pay gap and highlights the most important takeaways from our analysis. Make sure to “See the full story” (bottom right each story point)!